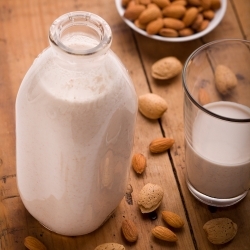 This homemade almond milk is incredibly delicious. I learned this recipe while visiting my sister Mary down in rural Virginia. My sister and I attended a cooking class taught by a raw food foodie who taught an excellent class in raw food preparation. I could not believe how delicious this recipe turned out. You will never want to drink store bought almond milk again. 1. Put the almonds, water, dates, and vanilla in a high-performance blender, and blend until smooth. 2. to separate the "milk" from the pulp, gently squeeze through a cloth mesh bag or a double layer of cheesecloth. Reserve the pulp. Storage suggestion: Stored in a sealed glass jar in the refrigerator. Almond Milk will keep for 4 days. Notes: Dates vary in their size and degree of sweetness. If using larger, sweeter dates, such as medjools, you may wish to use 2 dates rather than 3. Tip: Store leftover almond pulp in an airtight container in the refrigerator for up to 6 days, or in the freezer for up to 4 months (defrost before using). The pulp may also be dehydrated to create flour, by spreading it on a Paraflex sheet and dehydrating it at 105 degrees for 8 hours, then processing it in a food processor. Almond pulp may be used in breads, cookies, croutons, cinnamon rolls, and scones.